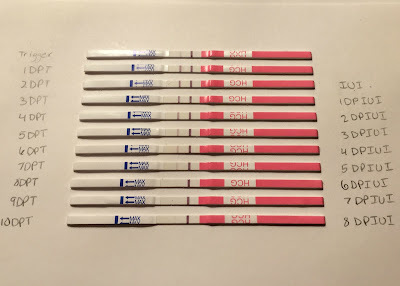 As of today, I'm 8DPO and 10 DPT (days past trigger). I've been testing out my trigger since I've had the injection. 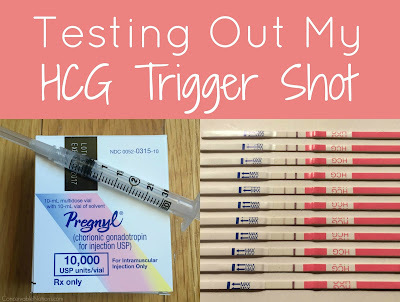 For those of you not familiar with a trigger, it is an injection of HCG that is used to trigger ovulation and the final maturation of the follicles. There are a few different brands out there, but they all have the same function. My trigger shot was Pregnyl, which was given subcutaneously into my belly. We had to mix the solution first before injecting it. Out of all the injections and blood draws, the trigger was actually the most uncomfortable for me. The injection site was painful, tender, and itchy for a few days afterward, which I found out is quite common. It wasn't too bad though! My dosage was 10,000iu of HCG. 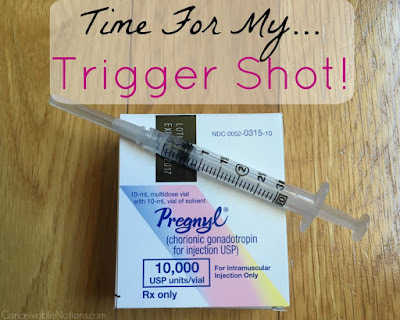 I was really interested to see how quickly the trigger was absorbed, so I took a pregnancy test a half hour and an hour & a half after getting the shot. After only 30 minutes, there was already a faint line on my test! And an hour later, it was much darker. 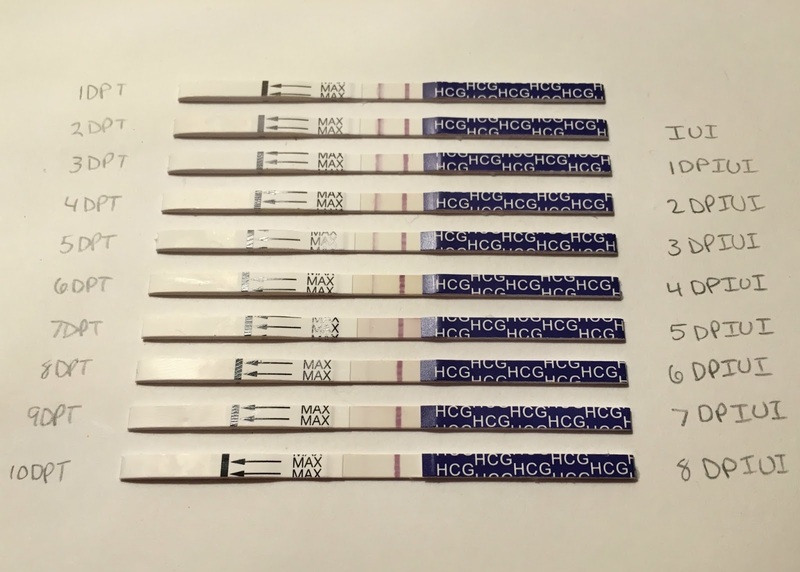 I decided to test out my trigger because I didn't want to end up taking a pregnancy test at some point in the cycle and get my hopes up that it's truly positive only to find out that it was just the trigger. Plus, I find all of this pretty interesting. Even today, 10 days after the trigger, I still have lines on my tests! I tested with 3 different brands that I had, mainly because I was curious to see the differences between the test sensitivity. Did I mention that I find all of this really interesting? ;) It might be a bit hard to see the lighter lines, but you can click on the photos to make them larger. 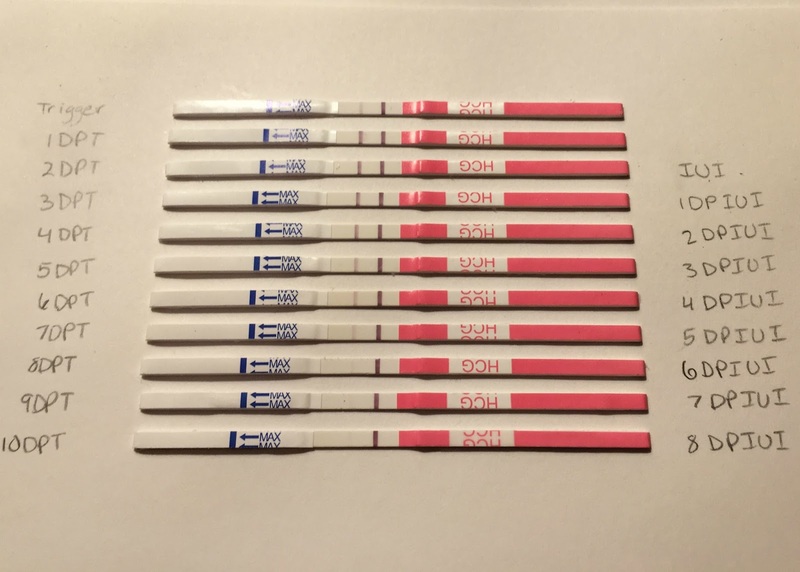 The trigger will usually fade by 10-14DPO and if you do actually get pregnant, you will see the lines reappear. Or if your lines never really faded away, they will simply start getting darker each day until it's very clear that you have a BFP! I'm still not sure how hopeful I should be for this cycle, because I do feel like it really would be a miracle to get a pregnancy from this cancelled IVF cycle. I will definitely update here once I find out the outcome! Last night I had my last shot for this cycle, which was my HCG trigger! Even though this cycle is not turning out like we had hoped, we are still going to give it our best shot at making it work. 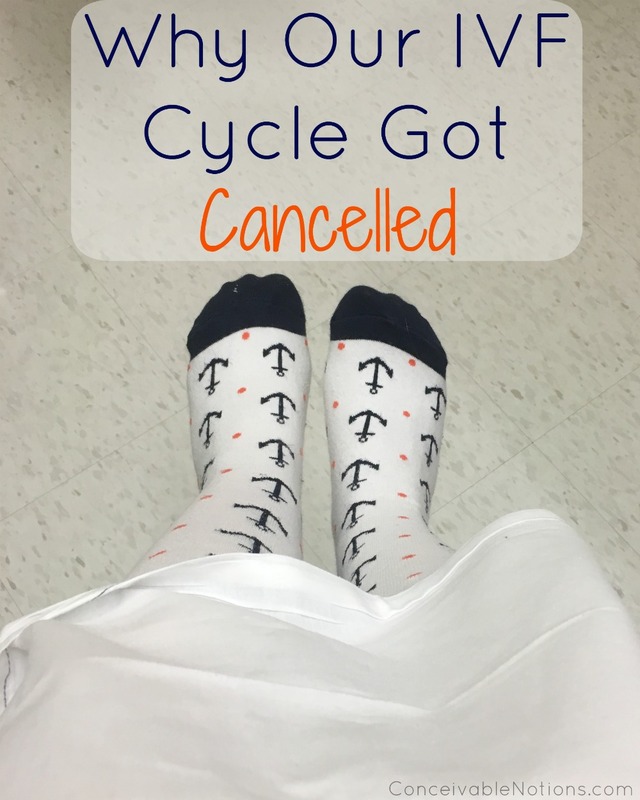 In my last update, I shared about why we decided to convert our IVF cycle to and IUI cycle instead. This was not a choice we wanted to make, but we feel like it was the right one for us. 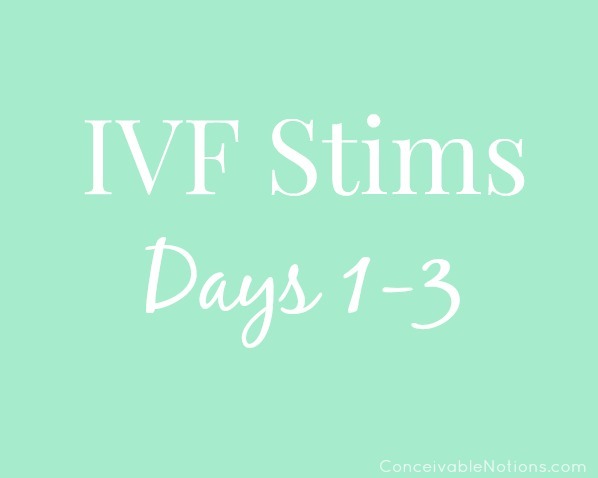 After deciding to convert our cycle to an IUI, I had two more days of monitoring which included both blood draws and ultrasounds. My lining for this cycle is around 10.24mm, which is excellent. My E2 level is still perfect. And at my last ultrasound (which was the on the morning of trigger day), I had 3 mature follicles, measured at 20mm, 19mm, and 18mm. I also had one at 11mm, which might grow large enough by ovulation to possibly contain a mature egg. All other follicles seem to have shrunk down, as all the energy was being put into these four. In total, I stimmed for 7 days. 6 days at 300iu of Gonal-F, and 1 day at 150iu of Gonal-F right at the end. My last Gonal-F shot was the night before the trigger. This actually worked out perfectly, as I was able to use exactly two 900iu Gonal F pens. These pens contain 900iu, plus 75iu extra in each pen. So for my last night of stims, I did two shots using up all the extra medication in the first two pens. So I have an extra 900iu pen, in case I need it for a future cycle. I started my Cetrotide (similar to Ganirelix) on my 6th day of stims. My last shot of cetrotide was on the morning of my trigger shot. I have a bunch of meds left over: 1 900iu Gonal-F Pen, all my progesterone in oil, my lupron kit, and 3 cetrotide kits. I won't be using the PIO, but instead will be using a combination of Crinone and Endometrin. I have a partially full box of Crinone and my nurse didn't want me spending any more money on meds unless I had to. So they will be giving me some Endometrin samples to hold me over. If I get a positive pregnancy test, I will order more! I'm thankful to not be doing the progesterone shots, as I don't really want to deal with them if we aren't doing an IVF cycle. 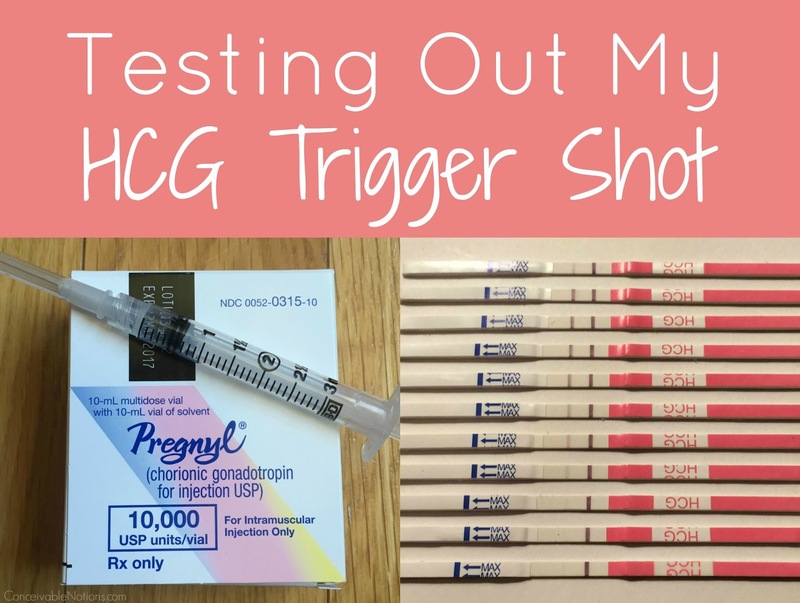 The trigger shot we used was Pregnyl, 10,000iu of HCG. We were instructed to do the shot at precisely 9pm. The trigger shot had to be mixed prior to injecting, but that is really simple to do. The concentration we needed was 1cc of the dilutant injected into the HCG powder. Once it is all dissolved, it can be drawn back into the syringe. Even though the box says it's only for intramuscular shots, our RE has us do it subcutaneously (and I know a lot of offices do this as well). Surprisingly, this was the most uncomfortable shot I had this entire cycle! The injection site has felt pretty bruised and is a little red and puffy afterwards. I was told this is pretty common though! Now we just need to have our IUI! Still really hopeful that this can work for us, but it will be a couple of weeks before we know for sure! Well this certainly isn't the update I was hoping to share! 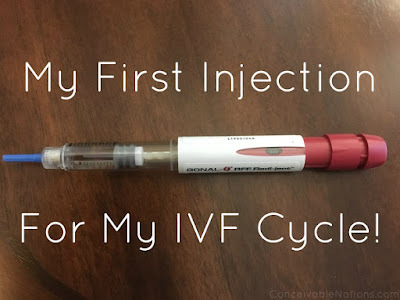 But two days ago, my husband and I decided to convert our IVF cycle to an IUI. This was not what we or our doctor expected to happen, and it's really not the outcome we were hoping for. But we have not lost hope for this cycle! When I went in for my monitoring appointment after 4 nights of stims, I was very concerned after I saw my ultrasound. I just didn't see very many big follicles and the doctor who did my scan was very evasive and did not answer my questions, but assured me all was "perfect and normal". At this point, there were 4 measurable follicles (at 10-11mm). She also reported that there was only one follicle at all on my right ovary! I've done 6 IUIs with Clomid, and for each of those I've had a 1-3 mature follicles, plus 2-3 smaller (10-13mm) follicles on each ovary, plus a bunch of smaller ones that are really easy to see. So why on earth would I have fewer follicles on an IVF cycle?! I was incredibly concerned and called my IVF nurse right when I got home. She agreed with all my concerns and didn't think it was at all "perfect or normal". My RE reviewed the ultrasound report and was skeptical. He didn't believe the other doctor's report, especially the idea of me having only a single follicle on my right ovary! He wanted me to come back the next morning (after 5 nights of stims) so he could personally do my ultrasound. He was definitely correct, that there were a lot more follicles than just 4, and certainly not just one on my right ovary! But... I had a group of 5 follicles that had seemed to have pulled away from the others. The largest was already 16mm! He gave us our options. We could add in Menopur which would hopefully force more of the smaller ones to catch up and give it all we could in order to get a few more eggs. Or we could convert to an IUI, and get a 25% discount on all services performed. If we proceeded with IVF, it very well could be a successful cycle. I am young, with a good chance at having excellent egg quality. But the chance of having any leftover for freezing was significantly reduced. Our RE thought we could do much better on another IVF attempt, especially since I had all the follicles there! They just didn't grow the way we wanted. Our RE clearly didn't want to push us in either direction, and was really interested in what we wanted to do. They said we could have the night to think about it, but my husband and I had already decided ahead of time what we would do in this situation. So we already knew our answer would be to convert to an IUI cycle. Why did this happen? Well we can't say for sure. But a few of the explanations we got were that I would just do better on different meds, and some people are just like that. Or that sometimes, it's just an off cycle. Or that there could even be some undetectable issue with me, and this could be our first hint that something isn't right. Maybe instead of mild male factor, there is something else too. We didn't have too long to discuss this with my RE, since we didn't have an appointment scheduled (and he had to do egg retrievals). But he really wanted to make sure we were given all the necessary information so we could make the best choice for us. I know many other couples going through IVF might have made a different decision than us, and plenty of people have success with only a few follicles retrieved. But we feel like this was the right choice for us. I haven't done any injectable IUI cycles, or used a trigger, or any progesterone supplementation. But what if this works? What if it's what we need, but we just didn't know it? Something happened that we didn't anticipate and maybe there was a reason for it. We are certainly sad that we aren't doing IVF this cycle. But we feel confident that we can go through this process again if we need to. The injections and monitoring weren't bad. I didn't have any horrible side effects, or any real pain from the injections or blood draws. I know I could do it again! We are remaining positive and hopeful that this IUI could really work for us! Even though we had wanted to do IVF, we are still trying something different than past cycles. I can't help but be hopeful that this could work! Today is day 3 of stims! It's actually been going by quite quickly. The injections are really not that eventful, and I actually feel really good! I did expect to have at least a few side effects after the first few shots, but the most I've felt is some slight ovary twinges last night and this morning. I'm hoping that means good things are happening in there! I've also been incredibly thirsty, which I'm guessing is both from the stims and the bloodwork. But I'm drinking 3+ liters a day! I already talked about doing my first injection, but I'll give a quick summary. On CD 2, I headed into the Center for my baseline bloodwork and ultrasound. After this was completed and reviewed, we met with one of the IVF nurses to give us the go ahead to move forward! We also received instructions on when I was to return for bloodwork next. That night, I did my first shot of Gonal-F, which was a dosage of 300iu. The shot was really easy, and not a big deal at all! I really like the injector pen. I iced before the first shot for a couple of minutes. Yesterday was my second day of stims. I was on the same dosage of Gonal-F (300iu). The injection was even easier the second time, since we had already done one. I had my husband do the second one, which he did an amazing job with! I actually forgot to ice prior to this shot, and I didn't have any burning as the medicine was injected. So I think I may not ice prior to injections in the future. I know some people find it helpful, but to be honest, I really don't like anything cold! This morning I was due in for another blood draw. Our Center does monitoring bloodwork from 7-9AM during the week, and the blood work must be completed by 9AM at the absolute latest in order to have the results in time for the doctors to review. It can be pretty busy right when the doors open in the morning, which I know from past experiences. I decided to go in a little later at 8AM to beat the rush, and it certainly paid off! I went right in and didn't have to wait. I was in and out in less than 10 minutes. The purpose of this blood draw is to see how well I'm responding to the meds. As your follicles grow during stims, your E2 level will rise. So your E2 levels give a pretty good idea of how things are going and how well you are responding. After hearing from my IVF nurse, my E2 level is exactly where they want it to be!! It started at 50 at my baseline and has risen to 146. A general rule is that they look for it to be doubling every 48 hours, but it does also depend on the individual case. Mine doubled in about 1.3 days or 31 hours. My progesterone level was very low at 0.3, which is where it should be. Because I'm responding exactly how they'd like, they will keep my dosage of Gonal-F the same for tonight and tomorrow. Tomorrow will be a "rest" day, as in no blood draw or ultrasound. I will go back the day after tomorrow for another blood draw and ultrasound. There is a chance I might need my Cetrotide if my follicles are large enough or if my E2 level has risen high enough, so they want me to bring it with me to the appointment, just in case. I actually feel great! Just really thirsty. I've been drinking a lot of water and coconut water everyday. I'm also doing some IVF/Stim friendly yoga daily, which is relaxing. But my absolute favorite thing is the Circle + Bloom IVF/IUI Guided Meditations. They are just so relaxing. If I'm completely honest, IVF so far isn't really what I expected it to be. I expected to be pretty stressed out as soon as I started stims. I tend to be anxiety prone, but I've felt really calm leading up to our cycle and for the first few days I've been stimming. So I am pleasantly surprised at this process so far. There is still plenty of time for me to get stressed out of course ;) But I'm just so thankful to be feeling so good! My First Injection for IVF! After getting permission to move forward from the medical team, we got to start my medication! So last night I did my first injection of Gonal-F, which was 300iu. As someone who has never liked needles, the injection part of IVF really was one of the big reasons I hoped to never have to go this route. But I have to say, that after talking to so many other ladies who had done injectable meds, almost all of them said it really wasn't a big deal. I decided to approach our IVF cycle with that mindset. So I truly didn't feel nervous at all leading up to the shot, which I didn't expect. I took the Gonal-F out of the refrigerator about a half hour before I was going to do the injection. It's more comfortable to inject something that's warmer rather than ice cold! It was really easy getting the injection pen ready. After checking to make sure there's no issues with the pen/any big air bubbles, all you have to do is add the needle, dial your dose, and you're ready to inject! The rest is simple. Make sure your hands are clean. Clean the area on your tummy with an alcohol pad. Pinch the skin a bit, and put the needle right in. Release the skin and press the injection button down. It will click as the medicine goes in. Then hold it for 5 seconds, to ensure all the medicine has left the pen. Remove it from your skin and apply a gauze pad. Check the pen to make sure the right amount of medication went in, and you're done! I decided to do my first injection myself, even though my husband offered to do it. I am going to let him do some, since I want him to feel comfortable giving me a shot by the time the intramuscular shots start! I got a little nervous once I had the pen in my hand and said something like "I'm not sure I can do it!". But I did! And it truly wasn't bad at all. I really expected to feel something after doing the shot. I mean I just injected a ton of hormones! But so far, I don't feel any different. I'm guessing it might take a few days for things to start happening in there! 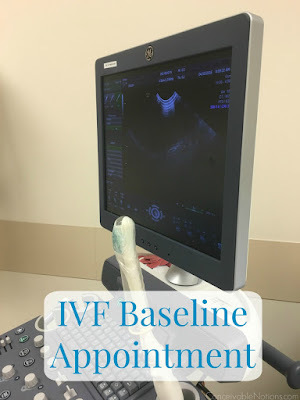 This morning, bright and early, we had our baseline appointment for our IVF cycle! What this means is I went into the office for both a blood draw and an ultrasound, to make sure everything looked good for us to start our cycle. I decided to do bloodwork first, since I get a little nervous about that. About 6 months ago, I had some trouble having blood taken and the blood literally would just not flow out of the veins! They tried both arms, about 7 different times, and two separate people tried. No matter what, they couldn't get a drop. That had never, ever happened to me before, and now I always have that experience in the back of my mind anytime I've had blood drawn. But ever since that day, I've had zero issues. Today was no exception, thankfully! My lab slip wasn't in the computer yet, since AF had decided to show on Saturday and I had to show up without an appointment, so it took a little longer than usual to get my blood drawn. Next, I headed upstairs to sign in for my ultrasound! Thankfully, there was only one person in front of me. I had to wait for only a few minutes before being called back. They took my height and weight, and then I got undressed for the ultrasound. Having an ultrasound during AF isn't the most fun thing in the world, but they have you sit on a sheet and keep you covered up. They even dim the lights to make you more comfortable! The ultrasound was really quick. My lining was thinning nicely and my ovaries looked quiet. After the ultrasound, I met with one of the IVF nurses to go over everything and get our next steps. We were cleared to start my meds tonight! And my egg retrieval is tentatively set for April 19th, but that may change depending on my response to the medications. I'm having a little bit of extra monitoring during our cycle (bloodwork sooner than normal) because I'm on a higher dose of Gonal F and they want to ensure I don't over respond. 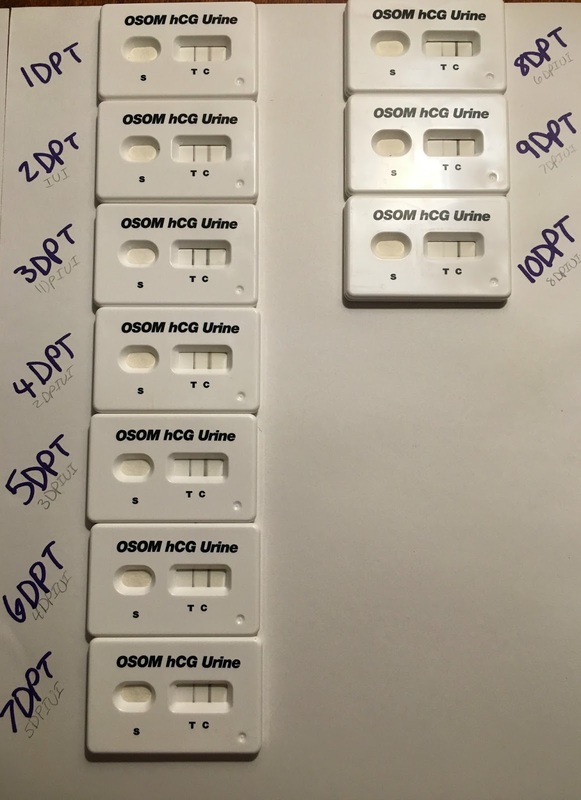 We asked a few questions, such as how many patients end up using the Lupron trigger vs the HCG trigger, and we were told a lot. Apparently, my fertility center was one of the first in the country to regularly start using Lupron as a trigger and they are very good at using it effectively. Set my mind at ease! The only thing that made me worry slightly was my antal follicle count. The person who did the ultrasound barely looked, and simply wrote down >5 for left ovary and >5 for right ovary. So I really have no idea how many follicles were actually there. When we met with the IVF nurse afterwards, said that the person who performed the ultrasound probably just didn't want to look for all of the follicles. I really wish she had though :\ I have found that when I go in on the weekends, appointments are more rushed, because once they are done with patients, they get to leave for the day. Keeping my fingers crossed that the rest of my ultrasounds fall on weekdays so I get a little more information! I was just so glad that the nurse didn't rush through our appointment at all, and really assured me that if there was anything concerning, they would tell me immediately. Our next steps is to do my first injection tonight! Really excited to move forward! My meds are finally here! They came in a pretty big box packed with ice packs, delivered by overnight shipping. I nervously watched the tracking number updates as it made it's way to me! It was being shipped FedEx, who I haven't had the best experiences with, so naturally I had a little anxiety about their safe arrival. I'll give a quick summary of all of the medications we received. I may need to order more or get some different medications depending on how the cycle goes. I'm also going to share the price we paid for all of our meds, because I think all of us thinking about doing IVF really wonder how much our meds will actually cost us. But it's important to remember that the prices of these meds fluctuate a lot! Our RE had our financial representative check to see what brands were cheapest, and which pharmacies would give us the best price as well as any discounts. The first medication we will be using is Gonal-F, which will stimulate my ovaries to produce as many eggs as possible. We received 3 Gonal-F Redi-ject Pens, each 900iu. The total cost of these pens was $2,142.00, with each pen costing $714. The pens need to be stored in the refrigerator. The other medication we could have been prescribed was Follistim, which also comes in an injection pen. But the price of Follistim was more than double in price at the time. So we were happy to go with Gonal-F! We are set to start off on 300iu of the Gonal-F each day. My nurse ordered 3 pens, which is enough to stim at 300iu for 9 days. But I am expecting to be able to step that dosage down as the cycle goes on, so I'm hoping I will not need to order any more. Cetrotide is started part way through the cycle, and acts as an antagonist (hence the name of the protocol being the Antagonist Protocol). This medication suppresses the body's natural urge to ovulate, so we can mature the eggs properly and time egg retrieval just right. Another brand of this medication is Ganirelix, which was more expensive at the time of purchasing our meds, so we went with the cheapest option. We received 6 Cetrotide Kits, which cost us $470.25 total, or $78.38 for each kit. I don't have the exact pricing for the Ganirelix, but it was over $100 for each kit. These two medications are essentially exactly the same, except for the way they are packaged. Ganirelix comes in a pre-mixed syringe, ready to inject. Cetrotide must first be mixed and drawn up into the syringe before injecting, which isn't difficult to do. The Cetrotide must be stored in the refrigerator. This is one of the triggers that was ordered for us, The trigger is what helps the eggs to mature fully and be ready precisely at the time of egg retrieval. The timing of this shot is critical! Even though the packaging on the trigger says "intramuscular shot only", they have found it works just as well when given as a subcutaneous shot, which is what we will be doing. There are quite a few brands of triggers, and they are all essentially the same. The Pregnyl cost us $92.00. This is the second trigger ordered for my IVF cycle. This was purchased as the 14 Day Lupron Kit, which is used in the long protocol (or Agonist Protocol). In my case, if needed, it will act as a trigger. I will use this trigger if it looks like I have been overstimulated and I am at risk for severe OHSS. By using the Lupron trigger, it will eliminate the risk of severe OHSS! There is extra monitoring involved if I need to go this route, and I will need extra bloodwork to be sure my hormones are cooperating. I will also need to use estrogen patches for the remainder of the IVF cycle. This kit cost us $129.00. After my egg retrieval, I will begin progesterone supplementation to support the uterine lining. This medication is given as an intramuscular shot. I will be using 22g, 1 inch needles for injecting the PIO. I'm quite petite, so I need to use a shorter needle than most people use. If I get pregnant from our IVF cycle, I will continue the PIO shots until after our first ultrasound. We had 3 vials of the progesterone ordered for us, which cost $81.08 or $27.03 each. As one of the many people out there who has zero coverage for anything fertility related, our insurance somehow allowed this medication to be added to our deductible. Along with our meds, we received all of the needles, syringes, and alcohol swabs that we will need for all of our injections, along with a sharps disposal container. The total cost of all of this was $16.50. This number may go up if we need to order any additional medications, or if I end up needing the estrogen patches after a Lupron trigger. If you are considering doing IVF, give yourself plenty of time to get the best price on medications. Our RE's office is incredibly helpful in getting the best prices for cash patients and making sure we get all the discounts available to us. But I've heard that a lot of offices don't do this. If yours doesn't, get quotes from a bunch of different pharmacies. Check with the drug manufacturers to see if they are offering any discount programs, compassionate care, or mail in rebates. These are usually listed on their websites, but aren't always available. Even if you think you aren't eligible for a program based on income, apply anyway. We somehow got an income based discount on a few things and I never would have thought we would have qualified. I'm not joking here, there were discounts even for couples making over $100k at our fertility center! Lastly, if your RE's office has a few pharmacies that they have a relationship with, you may be able to get additional discounts on your meds, which is one of the ways we saved quite a bit! 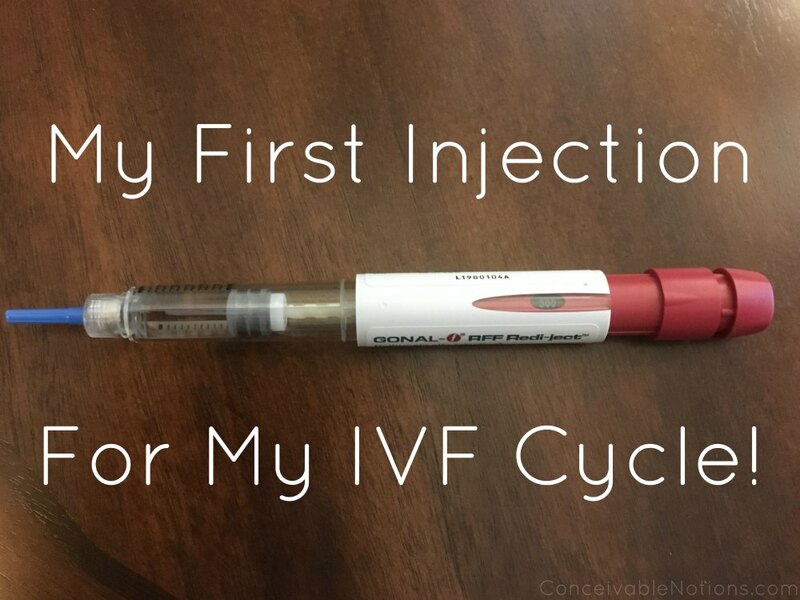 This is currently our 19th cycle TTC and we're just a few days from starting our IVF cycle. It's somewhere I never thought I would be. Deciding to move on to IVF is a really big step. At first, even IUIs seemed like an absolutely enormous step and the thought of needing to do IVF was just too much. Getting any sort of treatment at a fertility clinic can really remove the entire "natural" part of getting pregnant. At least that's how it felt for me. And IVF was this incredibly scary thing looming on the horizon and I was terrified that it was our path. As we did our IUIs and they became more routine to me, suddenly they didn't seem like such a big deal anymore. We came to really trust our doctor and we knew we gave it our best shot to get pregnant without further intervention. I couldn't believe it, but I got used to the idea of doing IVF. It suddenly wasn't so scary anymore. Getting started with our cycle is actually really exciting! I've done a complete 180 on my feelings about IVF, so I thought I would explain a bit how that came to be. 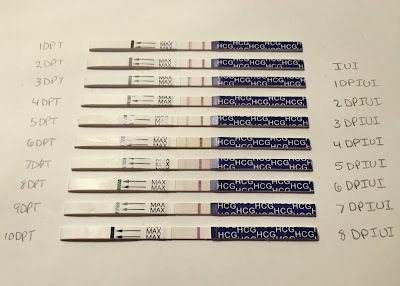 If you've been keeping up with this blog or my chart, you probably already know that we tried for a year, then did 3 IUIs, had a chemical pregnancy, then 3 more IUIs. Yet no successful pregnancy. 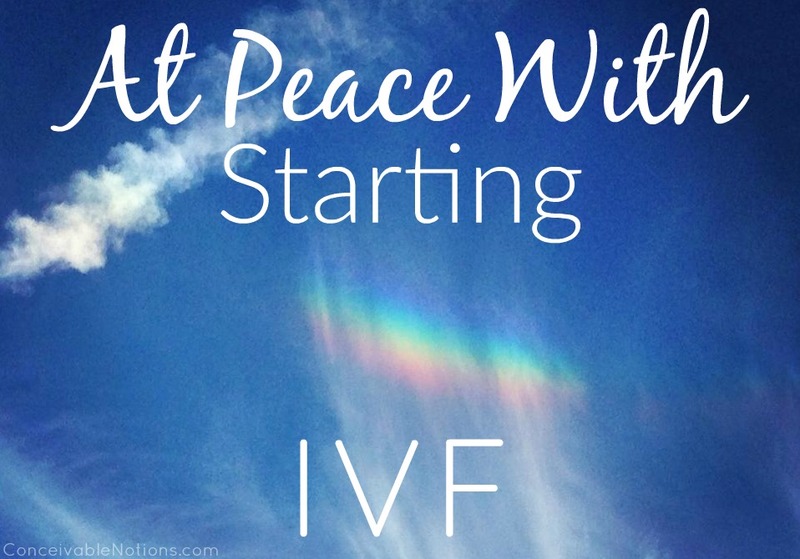 After our first three IUIs and the chemical pregnancy, I was not ready to move onto IVF. After having gotten pregnant from an IUI, I had to try more IUIs first. I knew that was what we needed to do. And after these last 3 IUIs, I feel like we did all that we could. We've had 13 cycles that we have tried naturally, all of which I charted and had perfectly timed BD. We have had 6 medicated IUI cycles, all perfectly timed. It's definitely time for us to start IVF. I feel pretty strongly that no one should consider moving on to IVF unless they feel ready. I think that point happens at different times for all of us. Even if your RE recommends you move straight to IVF, but you feel like you need to do a couple of IUIs first... push to do the IUIs. Give yourself the peace of mind that you need, whatever that may be. Learning all about the IVF process also helped me immensely. Learning about the medications, the different protocols, the procedures, and how the embryos grow all were really interesting and made me feel like I understood the process. I really enjoy detailed information, so I've read everything from the latest research articles to a bunch of blogs, and then plenty of IVF books. I even looked up the research that my RE and fertility center have been involved in. When it came time to do our IVF classes, I felt like I already knew all the information that was presented. It was extremely easy for us to decide if we were alright with specific procedures (such as ICSI, assisted hatching, and embryo freezing) because we had already done our research. We knew the recommended number of embryos to transfer for our situation, so that was a very easy conversation with our RE. If you're on the fence about IVF because it seems too complicated, try learning about the entire process more and just letting that information sink in for a while. It's really not as complicated as it seems! Talking to other women who have done IVF, reading blogs of IVF cycles, talking to women on kindara & fertility friend, and watching you tube vlogs was amazing. Seeing real people go through IVF, handle it well, and end up with a baby at the end... makes you realize you can totally do it too! I can't tell you the number of times I've heard someone say "It was not as bad as I thought it would be". I don't think anyone enjoys medical procedures or getting jabbed with needles, but everyone keeps telling me that it goes by so fast and that the shots are nothing to worry about, and I believe them. Lastly, be sure that you like your RE and your clinic as a whole. I have not had one single bad experience in all of the months we have been going to our center. Every single person has gone out of their way to be kind to us, help us when needed, and treat us well. All of my IUIs and testing has gone perfectly. Any time I've had questions, someone has gotten back to me right away. Our RE gives us his undivided attention at our appointments, doesn't rush us out the door, and genuinely cares about us. I have never in my life, had such a positive experience in any sort of medical setting. Being able to expect that kind of care moving forward, I know I will be in the best hands possible for our IVF cycle. If IVF is something that may be in your future, or it's something you are hesitant to do, don't move forward until you are ready. It took a long time for me to be at peace with this path for us. But now that I am, I can't wait to get started! 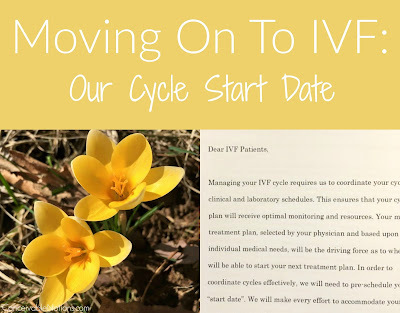 Moving On To IVF - Our Cycle Start Date! So I can barely believe this myself, but we are officially doing IVF! Spring is here and it's the perfect time for new beginnings. A couple of days ago, we had our appointment with our RE. The appointment was two and a half hours! About an hour and a half was spent with our RE, and the last hour was split between our financial service representative and our IVF nurse. We also found our the start date for our cycle... which will be sooner than we thought! We discussed a lot of different things with our RE. But the basic plan is that we will be doing the antagonist protocol, ICSI, and hopefully a day 5, elective single embryo transfer. With my AMH level (3.71), the look of my ovaries, my age, and all my test results, I would have qualified to be part of their egg donor program. Meaning that I am expected to be a high responder. Which is excellent news! But it does put me at a higher risk of OHSS, so that will be monitored closely. To counteract that, I may need to do a Lupron trigger, which will prevent any complications from OHSS. But that will only be used if needed. So we will have both a HCG trigger and a Lupron trigger, and will use whichever one we end up needing. The antagonist protocol was recommended for me because it's safer for potential high responders, especially when paired with the lupron trigger (if needed). I definitely trust my RE on this, because out of 1000's of patients, they only see 1-2 a year with severe OHSS and they have never, ever had a critical case of OHSS. Our RE recommended ICSI, which was something we were interested in doing already. He told us that 30% of the couples that do IVF at our center need ICSI in order to conceive. But a total of 70%+ of their IVFs are done with ICSI, because the technology has a lot of benefits. One of the interesting things he told us is that not doing ICSI is actually more helpful in determining the reason behind the infertility. But that involves potentially wasting eggs that may have been fertilized with ICSI, and realistically, are you more interested in finding out that they don't fertilize on their own, or would you rather have the best chance at fertilization? So ICSI is done in most cases at our center to really maximize your chances. At our center they expect a 75% fertilization rate with ICSI, and even as high as 100% in some cases. All of our testing was already completed, thankfully! All of our bloodwork was up to date, as well as my pap and physical, my HSG, and our genetic carrier screening was completed. I didn't even need to do a mock transfer because my RE was nice enough to write down all the necessary notes when he did my HSG. A lot of people have a saline ultrasound prior to IVF, also called a SHG. But I didn't need to do that either, because my HSG was absolutely perfect. Our RE said I had an absolutely beautiful uterus, which made us laugh! I hope our little embryo thinks it's nice and cozy! Having all our test results done means that we can start IVF right away.. as in 8-9 days from now when my next period shows up. One of our concerns was that my husband's morphology was very low, at only 3% normal forms when it was checked last. This alone qualified us for ICSI. With 0-4% morphology, ICSI is always done. And to ensure we have the absolute best sperm sample for our cycle, we will be freezing one ahead of time. 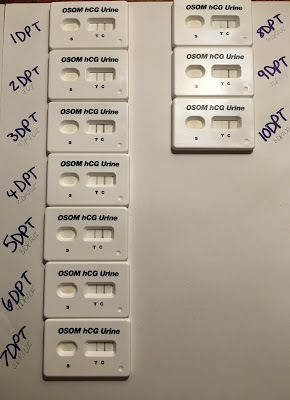 It's optional to do this, but I am absolutely terrified my husband will come down with some horrible flu or virus that will affect the sample. So for my peace of mind, we're going to drop off a sample to be frozen. It will most likely never be needed, but I'll feel better knowing it's there. The medications I will be taking are Gonal-F, Cetrotide, HCG or Lupron Trigger, and Progesterone in Oil. Before sending my prescription, they check all the current med prices and get a quote for us. Our financial service representative, who is so wonderful, checked prices at a bunch of different pharmacies. We ended up getting the best price through Apothecary by Design. Apparently, the med prices fluctuate quite often. Right now, Gonal-F is significantly cheaper than Follistim, and Cetrotide is much cheaper than Ganirelix. Since they are all the same thing, just different brands, they prescribe the cheapest option. 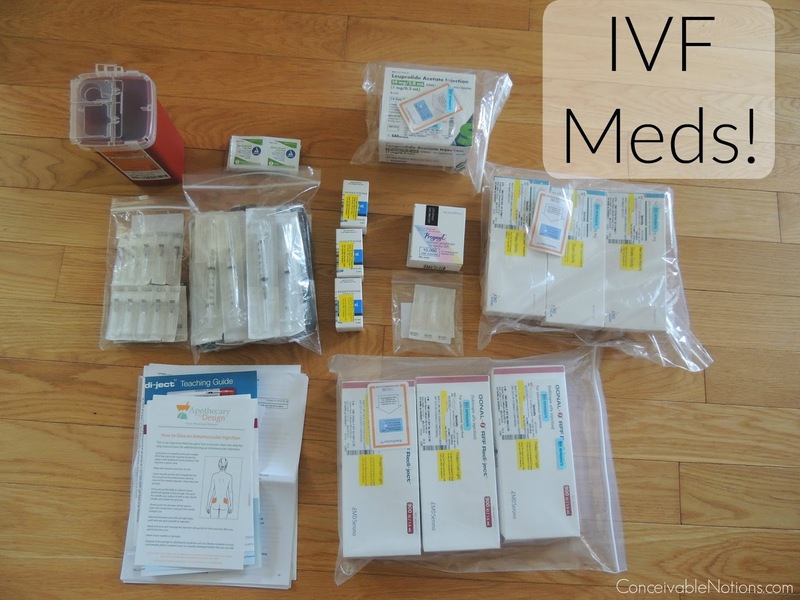 We then went through pricing for our IVF cycle. We have no infertility coverage on our insurance, so we qualified for the special cash payment discount. We were able to put it right on our credit card, then and there! The last person we met with was our IVF Nurse, who was so nice. It was the first time we had met her, since our nurse for the past seven months only does the IUI cycles. She went through our consent forms with us and gave us our instructions for our injection teaching, and monitoring information. It's hard to believe I'll be having my baseline in a little over a week! She gave us a big packet with our cycle information in it, and as our homework, we were to review everything and call her when we were done. Our center really does their best to help out cash paying patients, and our nurse told us that if we need just a little bit more meds at the end of our cycle, to call them first, rather than pay to order an entire new prescription. They receive samples of all the meds that they keep on hand to save people money when they can. Our RE was extremely positive about our chances. It was especially nice to hear that he expects egg donor quality eggs. But as all of us know, there are no guarantees with IVF. You can never predict what will happen. Maybe I won't respond to the meds how they are expecting, or maybe I have a lot of eggs but they end up being lower quality, or what if there is some other unforeseen issue and the eggs don't all fertilize as they should. We really just need to hope for the best outcome, but realize that things we don't expect may happen as well. Our center requires you to have three clearances to start your IVF cycle: Clinical, Medication, and Financial. The clinical clearance is all of your testing that must be completed before your cycle (or even before your treatment plan can be drawn up). We had all this done already, so we were able to check that right off. The next clearance was medication, and since we have no insurance coverage and are cash patients, we were all set there. Last is financial clearance, which I assumed we had since we actually paid for the cycle. But when I spoke to my nurse today, she told me that we didn't have our financial clearance yet! My guess is that it's just not put in the computer yet, but I will feel better once we are officially 100% cleared to start! Other than that, we just need to pay for our meds. The pharmacy we are using is trying to get our insurance to cover some of our meds. I'm skeptical, because they wouldn't even cover a $15 Clomid prescription... but it's nice to know that the pharmacy is doing everything they can to keep our price low. Once they've confirmed that insurance will or won't pay for a portion, then we will pay the remainder, and they will be overnighted to us!